Just four ingredients. Just 30 minutes. Yup. 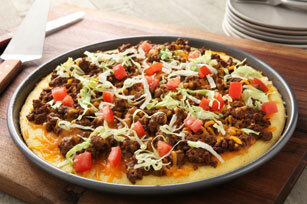 Our Taco Cornbread Pizza really is just that simple to make. Enjoy! Prepare corn muffin batter as directed on package; spread onto bottom of 12-inch pizza pan sprayed with cooking spray. Bake 8 to 10 min. or until lightly browned. Meanwhile, cook meat with seasoning mix as directed on package. Sprinkle 1 cup cheese over crust; top with meat mixture and remaining cheese. Save 50 calories and 7g of total fat, including 4g of sat fat, per serving by preparing recipe with extra-lean ground beef and KRAFT 2% Milk Shredded Cheddar Cheese. Serve with your favorite taco toppings, such as shredded lettuce, chopped tomatoes and/or TACO BELL® Thick & Chunky Salsa. Prepare recipe as directed, omitting the taco seasoning, and adding 3/4 cup KRAFT or BULL'S-EYE Original Barbecue Sauce to the drained cooked ground beef; cook until heated through, stirring occasionally.